Thank you for visiting my web site. I'll be adding several new pieces as they're completed. Commissions are always welcomed, specific quotes are available upon request, please visit the contact page or the phone number below for specific quote requests. Portraits usually require three to six month to complete. Factors such as pending studio schedule, complexity of subjects involved and choice of medium may influence the completion date. However, that is contingent upon the clients needs. Arrangements can be made for a reduced delivery date, if necessary. I will do my utmost to deliver the portrait within a reasonable time frame, please contact the studio for further scheduling inquiries. All work is primarily done from a combination of life, photography and preliminary sketches. I prefer working from life when possible but I also understand that schedules are sometimes unforgiving and as a result, photographs are also taken. If the client requests their photography, I will do my very best to accommodate their needs. On occasion, it may be necessary for a second photo session. The portrait begins with an initial meeting. There, we will get acquainted and have a discussion determining the type of portrait desired, medium, size, scope, the number of subjects, poses, clothing, setting, overall expression for mood, lighting & color harmony, as well as the location it will be displayed. Study drawings, notes and or color sketches of the subject(s) are also usually done at this time. After the collection of a signed commission agreement, with a forty percent deposit, I will return to my studio to begin. Later, I will present a preliminary drawing for your approval. After the drawing is approved, I am back again at the studio to paint a color study for you to have a sense of what the portrait will look like when finished. After approval of the color study, a second payment of thirty percent is due. 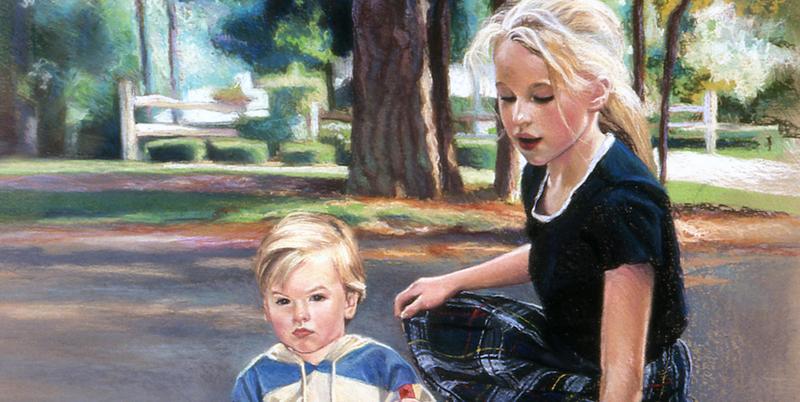 Once the portrait is completed, the remaining balance is paid and the portrait is then shipped or delivered. Every effort will be made to ensure your complete satisfaction. I will NOT send the final portrait to you until you have approved it and are completely satisfied with the end result. Starting fee for a 15" by 20" bust (head and shoulders) drawing rendered in pen and ink, graphite or charcoal is $1250. * For each additional figure add 50%. Fully involved backgrounds add 30%. Add 10% for each pet. * Please note: Black and white backgrounds are not eligible for credit and none will apply to black and white portraiture. All portrait fees are based according to the choice of medium, size, number of subjects involved and the complexity of the background. With the exception of watercolor, sizes range from 16" by 20" and up for a single figure bust (head & shoulders only) portrait with simple mottled background. Prices may vary due to the intricacies of each portrait, i.e., dimensions larger than 16" by 20" inclusion of hands and feet, gloves/shoes, detailed jewelry and/or clothing, with very involved designs, ornaments and/or decoration have influence on the fee. * For each additional figure add 50%. For fully involved background add 30%. Add 10% for each pet. * Please contact the studio regarding commissions for full figured subjects with complex backgrounds, please contact me for this pricing information as each piece is quoted for individually. Quotes are for unframed artwork only. Due to the intricacy of the collage & mosaic mediums, portraits may be scaled larger than life size with a simple background. All incurred travel and or lodging expenses (if any) frames and or shipping are additional. Prices subject to change without notice prior to purchase agreement, the 50% deposit reserves placement on the waiting list and holds current price. "Ella & Tommy" 19" h by 24" w • Pen & ink with ink wash. Portraits in oil start at $4,500 * for a bust (head and shoulders) 16" w by 20" h For larger size please contact the studio as pricing information is quoted individually. Each collage is unique, please contact the studio as pricing information is quoted individually. Portraits in watercolor are generally less than oil portraits. Starting at $2250 * for a 11" w by 15" h bust (head and shoulders). Add $1000 for a 15" w by 22" h. For larger sizes, please contact the studio as pricing information is quoted individually. 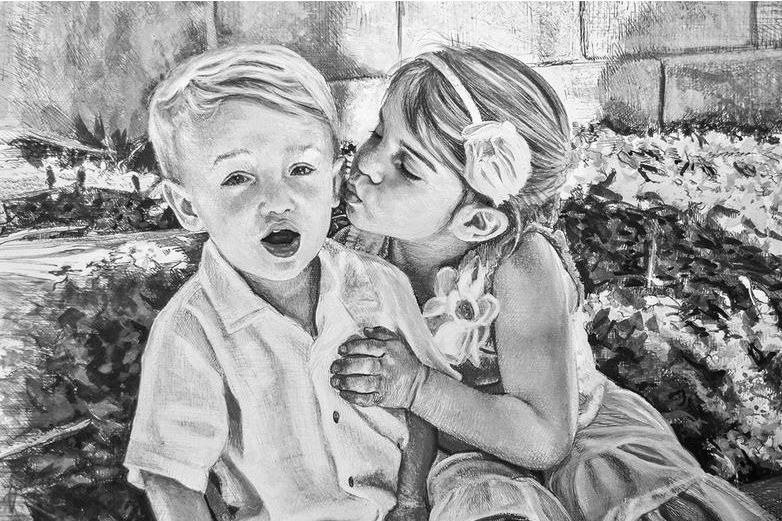 "Kate & Max" 40" w x 30" h • pastel on illustration board • Portraits in pastel- starting fees are generally comparable to watercolor fees,* please contact the studio as pricing information is quoted individually. A wide spectrum of individual Fine Art pieces are available as well as services for dynamic Illustration and Design solutions. Specializing in large format projects for design firms, museum exhibits, universities, trade show venues and special presentations to suit your particular needs. For a quote, please visit the contact page above or call the number below to discuss your next fine art, illustration or design project. If no one picks up, please leave a brief voice message, with your name & phone number. I will return your call as soon as I can. Thank you again for visiting my web site!